Using the list of stakeholders, draw a stakeholder relationship map to identify the relationships that exist between the different actors with an interest in the issue being addressed (e.g. the relationships survivors of violence have with different organizations). A relationship map can illustrate which actors work together as well as the nature of the relationships (strong, weak, no relationship), for example, by using different types of lines and spacing actors closely together or far apart. 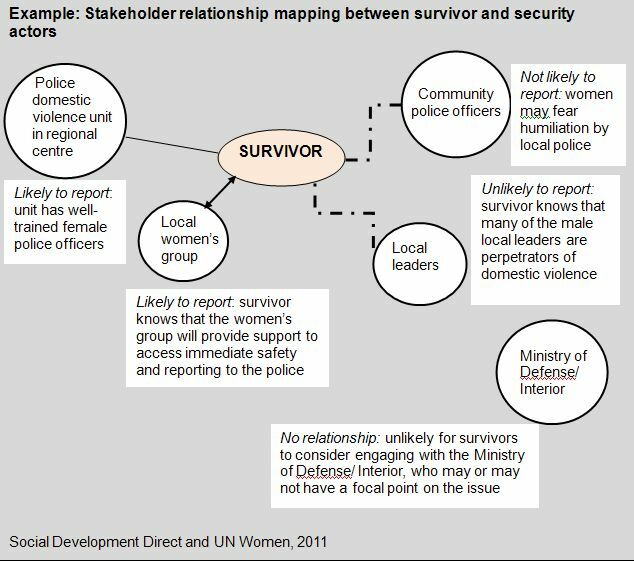 Mapping of stakeholder roles and responsibilities can identify potential entry points and partnerships for an intervention, such as strengthening police responses to survivors by working with referral networks which include designated police gender-based violence focal points. Greater gender training for all security agencies, including private security companies. More capacity building and training opportunities for female recruits. Consideration of a single training academy for all security institutions, and development of a single context-specific gender training module for use by security institutions. More joint trainings, information sharing and coordination among actors, including more partnerships between security actors. Developing a gender and peace-building department within the University of Liberia. Input from gender experts in the development of a Liberian Armed Forces gender policy. Upscaling the role of civil society including women’s groups and networks and their inclusion in peace-building efforts as well as gender and security programmes. Enhancing visibility of sector-gender initiatives through newsletters and other means. Development of mechanisms for the Ministry of Gender and Development to better monitor and evaluate the implementation of government gender policies and programmes. Greater funding for capacity building and implementation of gender-sensitive programmes. Establishment of human rights sections/focal points within security institutions, with greater reliance on training by the Independent National Commission on Human Rights. Organizing a national Gender and SSR day for public awareness-raising and discussion. Stronger gender and security sector oversight capacity for national legislature to enhance civilian oversight of the military and other security forces. Reviewing all legislation relating to the security agencies and initiatives to make legislation more effective, coordinated and gender-sensitive. Conducting more research on the role of private security companies to revise and tighten regulations governing their activities. Developing mechanisms to increase women’s participation in County & District Security Councils. Consideration of family relations and roles and its impact on women’s incentives to participate in the security sector, through assessing community and family practices. Adapted from: Griffiths, C. for DCAF. 2011. Mapping Study on Gender and Security Sector Reform Actors and Activities in Liberia. DCAF. Geneva.